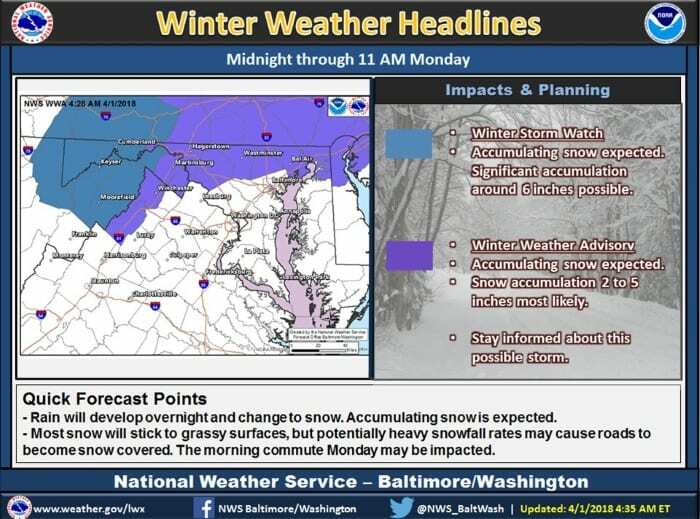 More winter weather is in the forecast and the National Weather Service has issued a Winter Weather Advisory for portions of Baltimore County. The Winter Weather Advisory is in effect for northern Baltimore County from midnight through 11 a.m. on Monday morning. Most accumulations should be limited to grassy areas and temperatures are expected to remain above freezing, but potentially heavy snowfall may cause roads to become snow covered. A Winter Weather Advisory usually indicates that snowfall accumulation of 2 to 5 inches is expected. A Winter Storm Watch is in effect for western Maryland. View the graphic below from the National Weather Service for more information.